Spartak is a village located 3km North of Donetsk, the capital of the self-proclaimed republic with the same name; before the war there were about 5,000 inhabitants living there, today only 45. Since the beginning of the conflict, because of the fighting, about 210 people have died in Spartak while there is not an exact figure of the number of wounded. Almost all residents have fled either to Ukraine, some in Donetsk, some in Russia, while others have been relocated in dormitories run by the separatist government. Today Spartak seems a place that survived a nuclear holocaust in which the survivors move like shadows. Among the rubble of the terraced houses and along the deserted avenues, packs of stray dogs roam around, while the ghostly silence is broken only by the noise of the wind-blown plates and the sounds of war that here and in many other places along the front line , hangs with all its horror. Svetla and Marina along the route to get to the bus stop to then go to school. 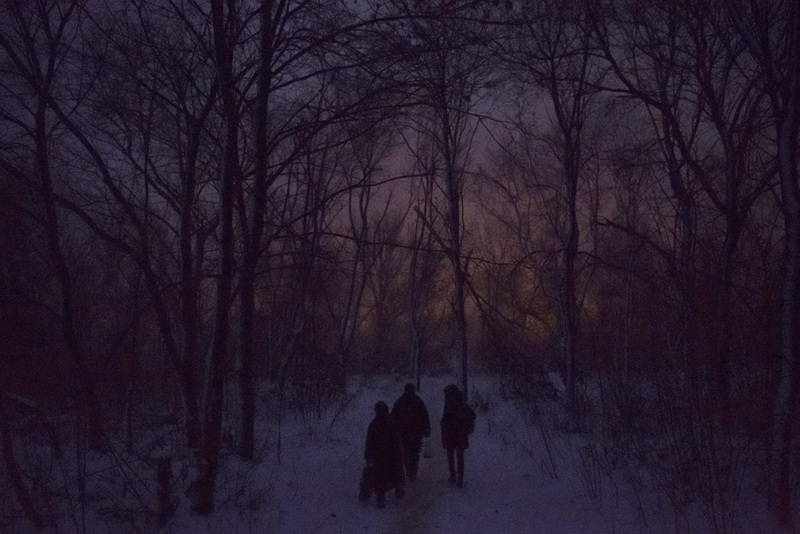 The entire journey is on slippery ice and in complete darkness, without using electric torches for fear to be seen by the numerous snipers hiding close by.